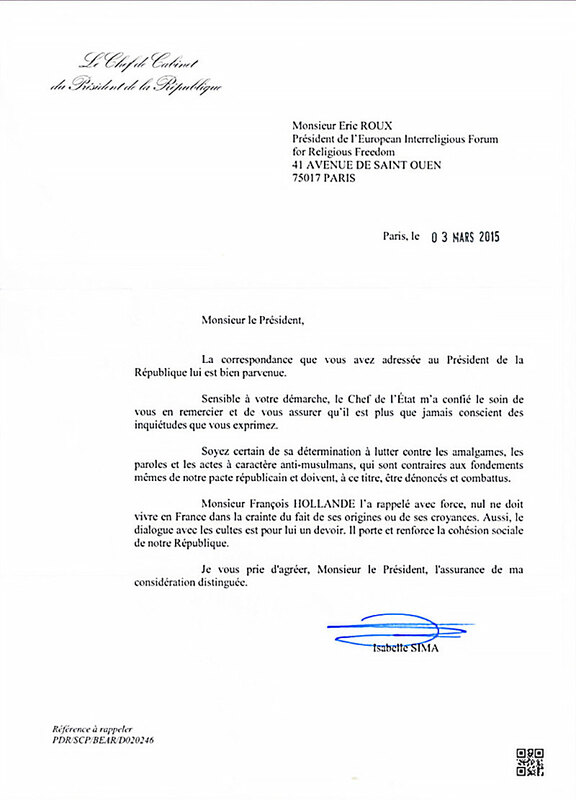 We received today an answer from the Director of the French President cabinet, following our multi-signatories "letter to French politicians" that you can find here. "Touched by your approach, the Head of the State entrusted me with the task of thanking you and assuring you that he is more than ever aware of the concerns you express. Be certain of his determination to fight against amalgams, anti-Muslim words and deeds, which are contrary to the very foundations of our republican pact and should, as such, be denounced and fought. President François Hollande reminded forcefully that no one should live in France in fear because of his origins or beliefs. Also, the dialogue with religions is for him is a duty. It strengthens social cohesion of our republic." I just wanted to let you know that the voice of the signatories has been at least heard. The IRF Roundtable is an informal group of individuals from non-governmental organizations who gather regularly to discuss IRF issues on a non-attribution basis. It is simply a safe space where participants gather, speak freely in sharing ideas and information, and propose joint, multi-faith advocacy actions to address specific IRF issues and problems. The Roundtable is informal to the point of being routinely referred to as a “non-group,” and this is an inclusive, participant-driven space that is open to anybody and everybody.